First up, Temecula Embroidery from Thibaut. We actually used this pretty blue fabric in its wallcovering counterpart on the ceiling of the bathroom I designed at the 2017 Hamptons Designer Showhouse. This print would look great in the breakfast room of a blue-and-white kitchen, with a bright coral tabletop and accents. Its cheerfulness evokes Spring, but its classic color combo and pattern make it versatile enough for year-round style. 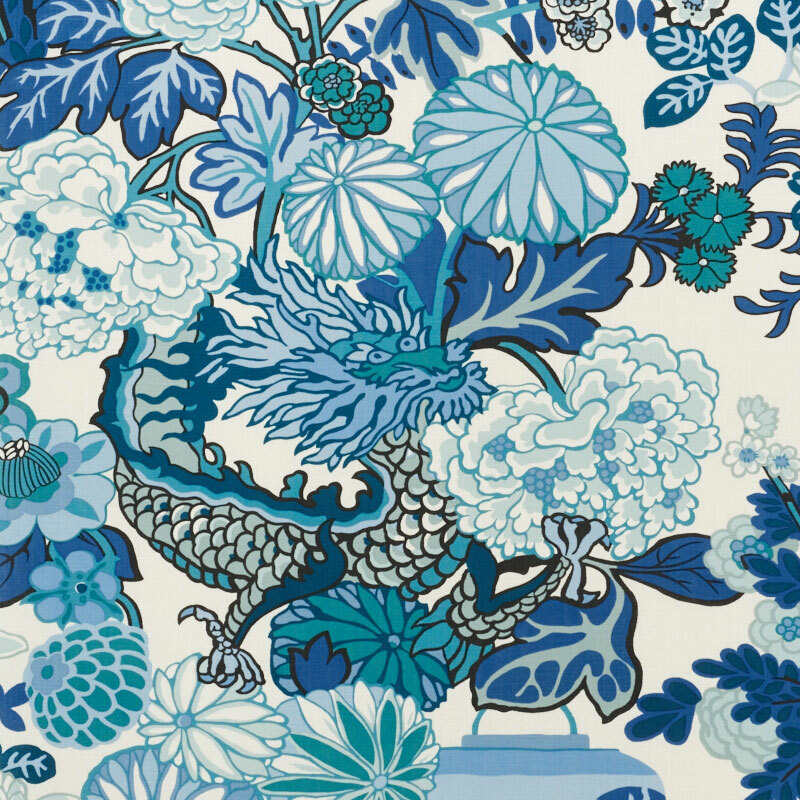 Another pick for the season is this striking Chiang Mai indoor/outdoor performance fabric from Schumacher. I love to use black and white as an outdoor color scheme, adding in pops of colors that mimic the look and feel inside the home. This particular fabric would be great for pillows on a poolside chaise or as accent throw pillows on a black sofa. 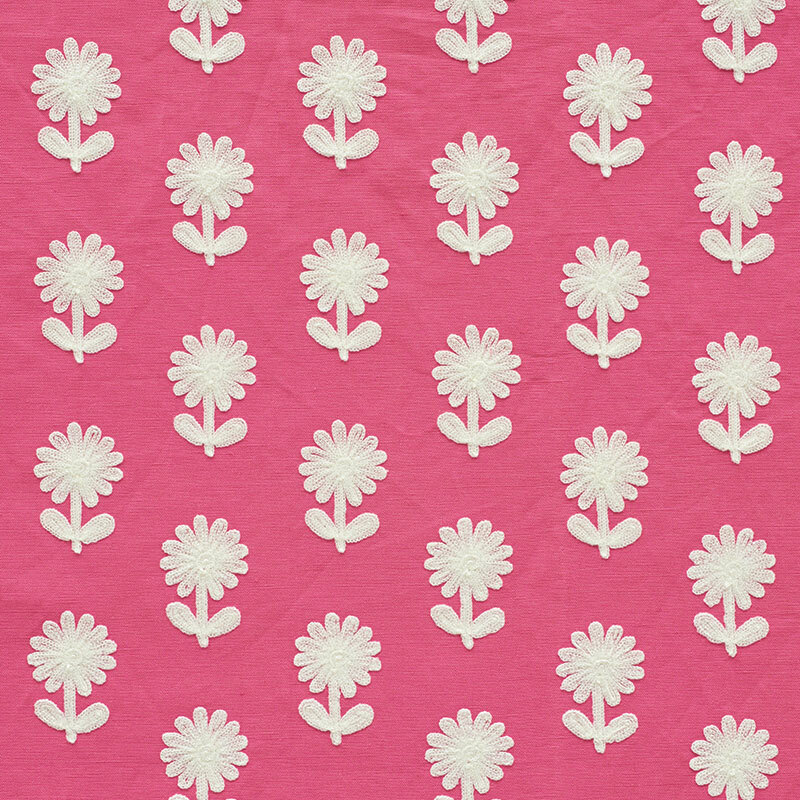 What’s more Spring-y than a pink-and-white daisy embroidery? We love this one, Paley Embroidery from Schumacher, so much that we’re using it on a current project as window treatments and a bed skirt in a little girl’s room. And last, but certainly not least, I had to include two traditional florals. The first is Luiza by ROMO Black. It comes in several color schemes—and a wallpaper, too. Although I don’t typically incorporate florals into my designs, this one is an all-time favorite. It’s both classic and modern at the same time, making it feel both sophisticated and relaxed. We are currently using it for drapery panels in a master bedroom with a 12-foot ceiling. I can’t wait to show you the final design! The second floral I want to share is Happy Garden from Quadrille—and everything about it is indeed happy. From its oversized blooms to its beautiful colorways, this classic Spring floral would look gorgeous on an English sofa or lounge chair. So, although we may have to wait a few more weeks in the Northeast for some Springtime weather, I can find solace in garden-fresh designs like these.